BERLIN, Germany (CNN) -- The world needs a "global New Deal" to haul it out of the economic crisis it faces, Prime Minister Gordon Brown of the United Kingdom said Sunday. 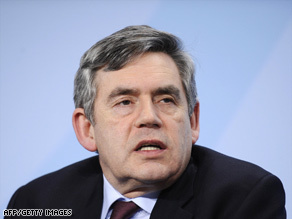 Gordon Brown addresses a press conference following a G20 preparatory meeting in Berlin, Sunday. "We need a global New Deal -- a grand bargain between the countries and continents of this world -- so that the world economy can not only recover but... so the banking system can be based on... best principles," he said, referring to the 1930s American plan to fight the Great Depression. Brown was speaking as the leaders of Europe's biggest economies met to try to forge a common position on the global financial crisis ahead of a major summit in London in April. French President Nicolas Sarkozy said the world's response to the global financial meltdown had to be profound and long-lasting, not just tinkering around the edges. "Europe wants to see an overhaul of the system. We all agree on that. We're not talking about superficial measures now or transitional measures -- we're talking about structural measure, which need to be taken," he said. German Chancellor Angela Merkel, the host of the meeting, urged nations of the world to work together to fight the problem. "Confidence can only be restored if people in our countries feel that we are pulling in the same direction and have understood that we really must learn lessons from this crisis," she said. And she proposed that a new institution grow out of the crisis, "which will take on more responsibility for global [financial] mechanisms." The Europeans say they have agreed international financial markets must be regulated more thoroughly. That also means stricter rules for hedge funds and credit-rating agencies. European and world leaders have been holding frequent summits as they struggle to cope with a financial crisis that has affected banks, homeowners, businesses and employees around the world. London will host a meeting of the Group of 20 nations in April. The G-20 includes the G-7 leading industrialized nations -- Canada, France, Germany, Italy, Japan, the United Kingdom and the United States -- as well as the world's largest developing economies: Argentina, Australia, Brazil, China, India, Indonesia, Mexico, Russia, Saudi Arabia, South Africa, South Korea and Turkey, plus the European Union. The managing director of the International Monetary Fund and the president of the World Bank, plus the chairs of the International Monetary and Financial Committee and Development Committee of the IMF and World Bank, also participate in G-20 meetings.